As a part of series of events organized throughout the world to celebrate the 50 years of Leonardo, Alta Tecnología Andina - ATA, the National School of Fine Arts in Lima and Proyecto Amil will pay tribute to Swiss-Peruvian artist Francesco Mariotti to mark 50 years since the presentation of his pioneer work "Cubo luminoso," Projekt Geldmacher-Mariotti 1968, during the fourth documenta in Kassel. 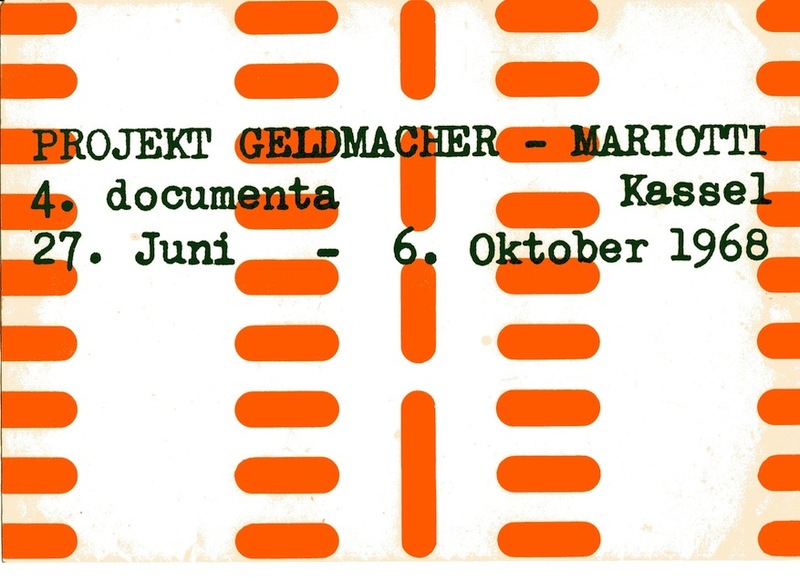 Image: Link zum Projekt "Projekt Geldmacher-Mariotti, Kassel"
In 1968, 26-year-old Francesco Mariotti, along with colleague Klaus Geldmacher were selected to present a work for the 4 documenta in Kassel, Germany. The proposal included the deployment of a large cube-shaped metal structure composed of 9,000 bulbs, 100 fluorescent lamps, a monumental fan and several loud-speakers. The installation generated a "photoacoustic environment", creating an immersive experience for the visitors. The installation, located in the Orangerie, along with another remarkable project presented by Christo, was considered by the media at that time as one of the major attractions during the renowned exhibition of contemporary art. This double 50th anniversary coincides with the centenary of the National School of Fine Arts in Lima where 1976 Mariotti designed and lectured the first course of art and communication that was taught in an art school in Peru (the document is available here). The celebration in Lima “50 years of Leonardo / 50 years of “Projekt Geldmacher-Mariotti 1968” will also include the delivery of the "LEONARDO Pioneer Award" to Francesco Mariotti, on the occasion of commemorating this year the 50th anniversary of one of his most representative works as well as his artistic endeavors connecting Latin America and Europe in distinctive dialogues related to social processes, natural phenomena and technology. 3. Panel of specialists: Gustavo Buntinx, Lizet Diaz and Miguel López. Program details in Spanish here. Alta Tecnologia Andina (ATA) is a non-government, non-profit cultural organization, created with the objective of developing a new culture based on the relations between art, science, technology and society in Peru and Latin America. The foundation for this development involves the production, promotion and support of projects and transdisciplinary research, writing, and exhibitions. ATA's platform also includes a specialized archive and a library, available both online and onsite.